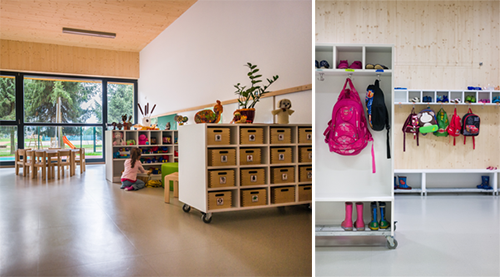 Instead of the usual bombardment of bright colours and plastic play equipment, this child centre offers children opportunity to discover natural phenomena in the natural world. 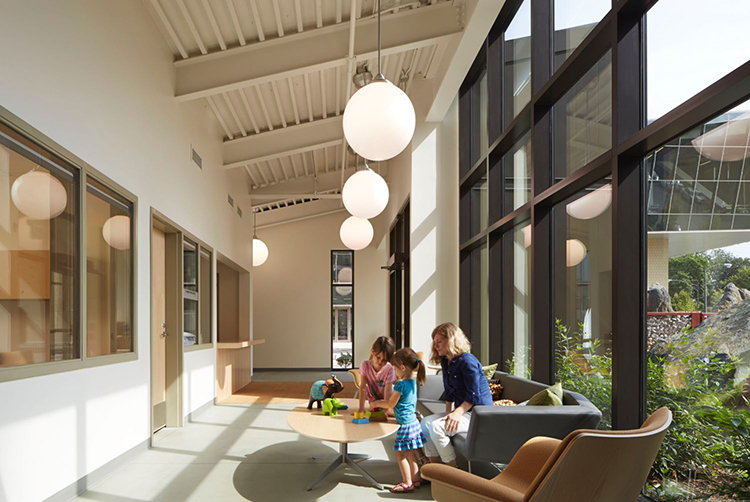 The UChicago Child Development Center in Stony Island designed by Wheeler Kearns chose minimally processed materials for its construction and a z-shaped plan, optimising daylight and providing plenty of access to the outdoors (of which have a footprint larger than the building itself). 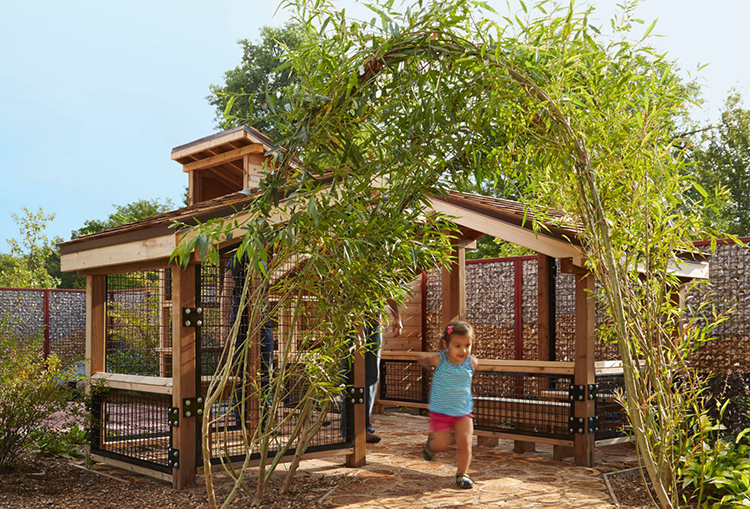 The eastern wing, clad in tree bark, is designed for infants and toddlers. 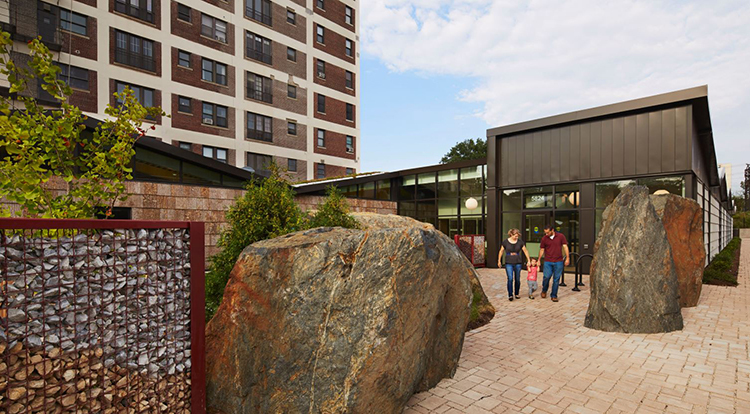 The bark is constantly drawing attention, the architect Larry Kearns says, noting that people "always want to come up and touch it." 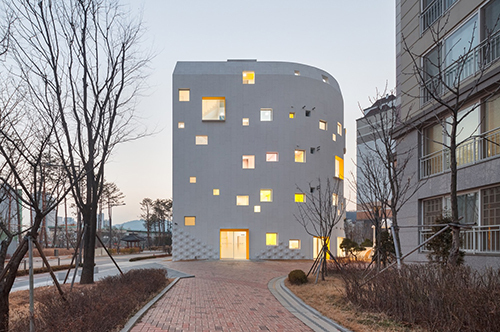 The western wing is clad in unpainted cement board siding serving children up to 5 years old. 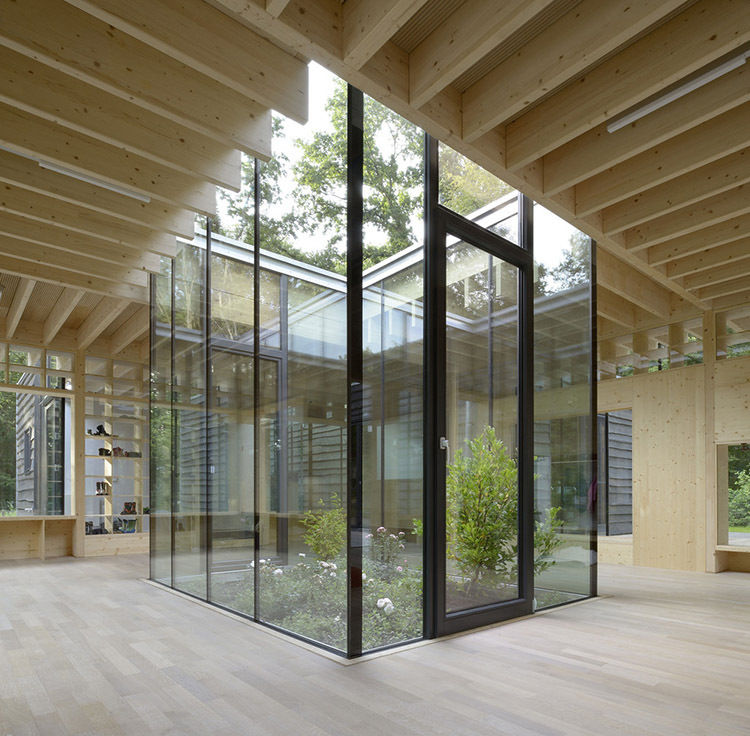 A gently folding roof (half of which is covered with vegetation) shows exposed steel beams and tray decking under, whilst internally and clerestory windows provide ample natural light. At the centre of these two wings is the building's entrance and heart. 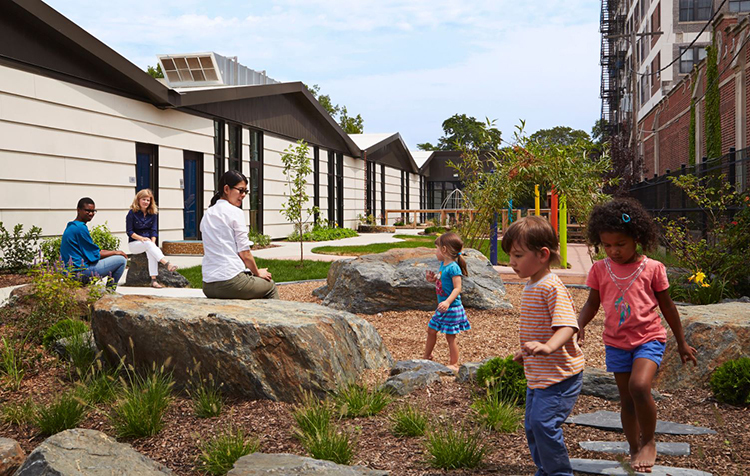 The journey to which is characterised with monumental boulders, a gabion stone fence and ornamental trees providing a sensual and memorable experience upon the child's arrival. 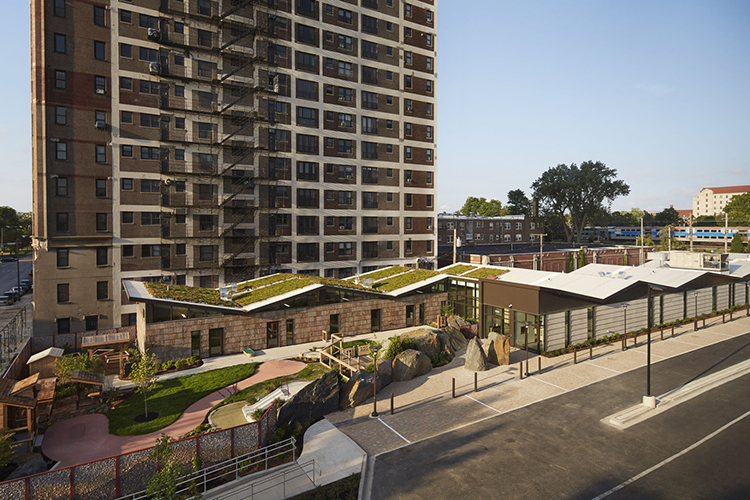 The projects' architects Wheeler Kearns were influenced by the historic Jackson Park across the road designed by Frederick Law Olmsted in 1871, whose principles of freedom of movement and natural equality were to create a unified and total work of art were expressed with winding and inviting paths. 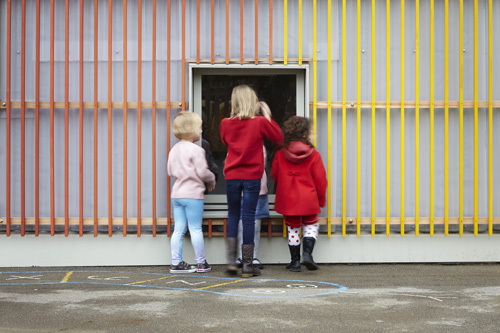 Further to this was the idea of 'free association' - therefore giving expression to areas that encourage socialisation or meeting places. (For more on Olmstead's parks see here). 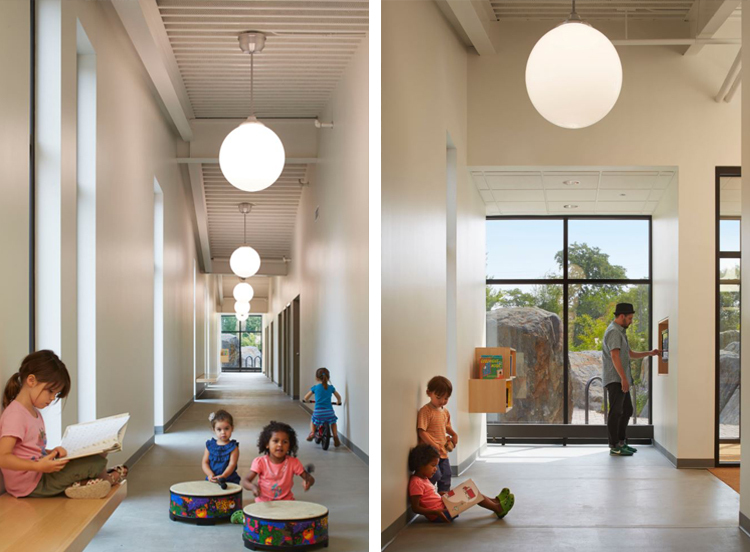 Rather than grand design statements, the architecture offers subtle variety and an abundance of texture to encourage many types of play and learning experiences. 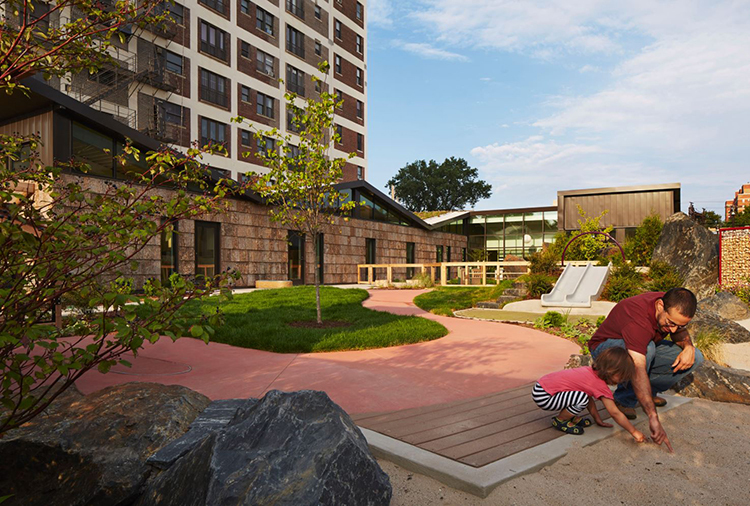 Says the AIA (2005 Design Excellence Awards): "[the centres' design] emphasizes the natural landscape over the built one [including] different surfaces inviting children to crawl, roll, ride, climb and walk - to learn about their five senses while interacting with nature." 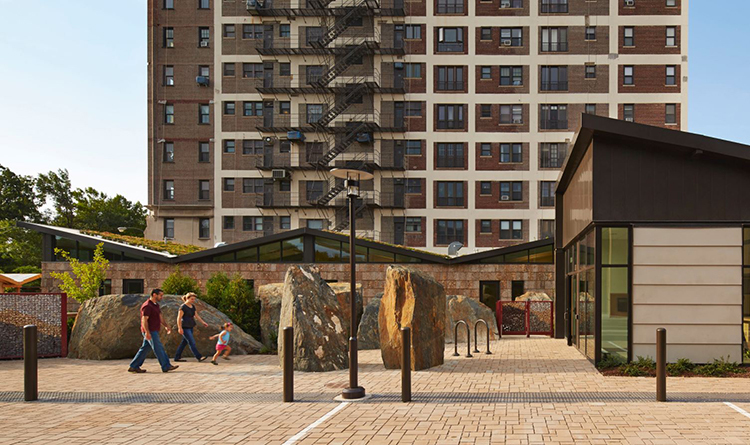 And when it rains, the water falling onto that roof is purposely spilled into splash tanks, which divert the stormwater. It becomes like a fountain, Kearns explains, demonstrating a natural phenomenon to the city kids playing inside the center. 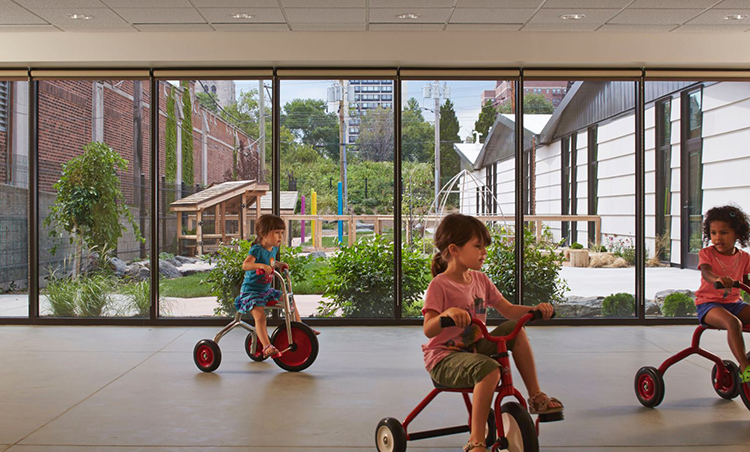 Here, the built environment not only encourages children to interact with nature, they are willed into valuing it. 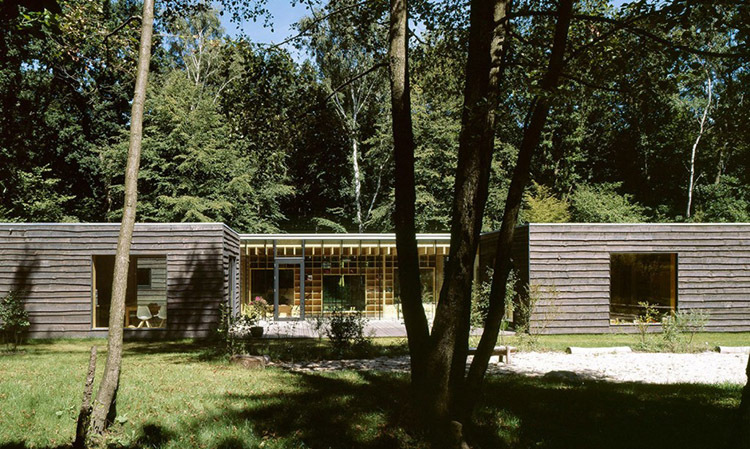 Project submitted by Wheeler Kearns Architects. 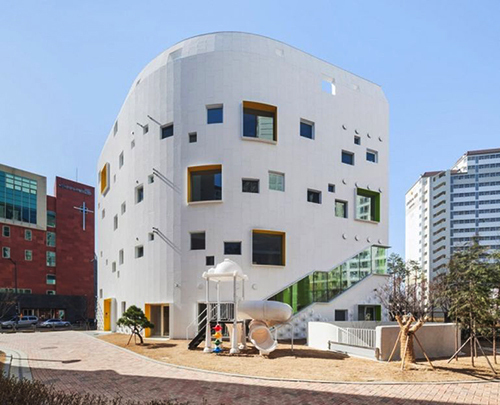 It is rare to get early childhood architecture that considers so many of the characteristics that embody early childhood pedagogy as does this kindergarten designed by OA Lab in South Korea's capital city Seoul. 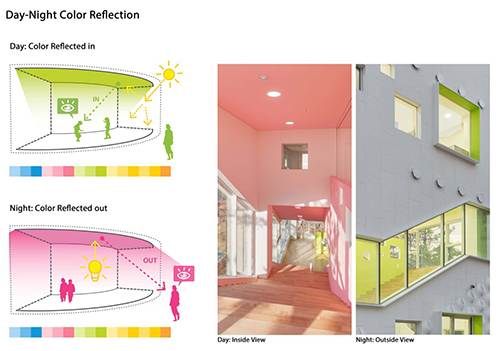 Situated in a dense urban environment, OA Lab's director Jungmin Nam believed the building could be a "breath of fresh air" to the neighbourhood, stating that "most kindergartens in the city [are] poorly designed [often] reflecting economic values, regulations and small lot sizes." 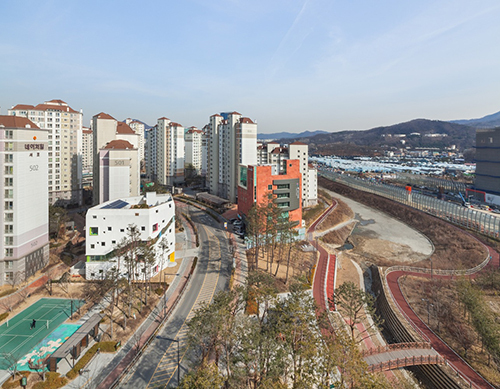 The building does seem to achieve a rather perfect balancing act of simultaneously "fitting in" to its surroundings and offering Nam's said "breath of fresh air" - here it stands proud with its colourful and varying sized square windows and transparent winding internal stairs penetrating an otherwise apparently plain white 7-storeyed skin. 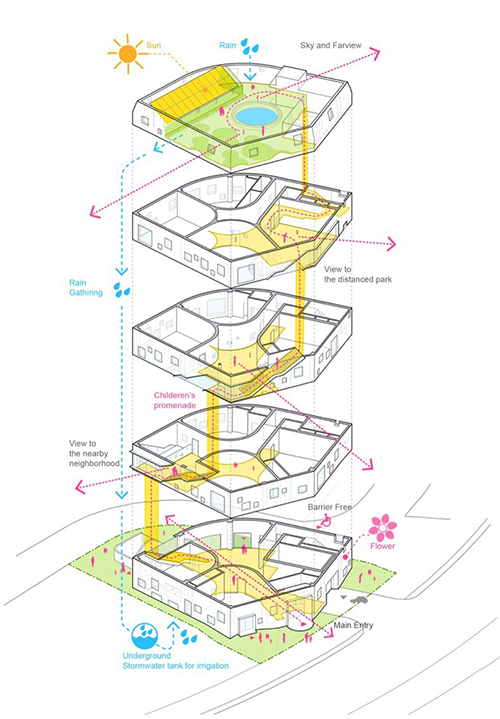 In fact the building's form has been derived from a considered approach in maintaining as much useable space whilst considering things like access from the street, sun angle and exposure to the sky, and creating as much access to the natural outdoors as possible (as shown in the diagram above). 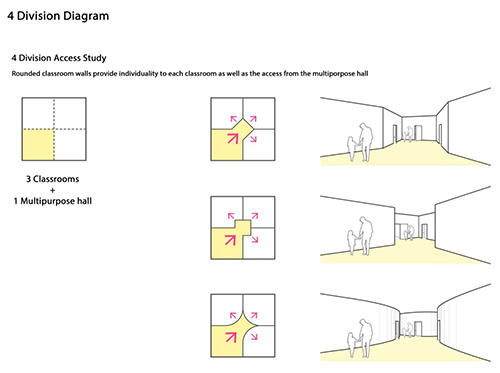 This form was then broken down into ground level service spaces (such as staff facilities and parking), three levels containing three "classrooms" or group areas and a "yellow" multipurpose hall which rotates at each level creating a dynamic vertical shared promenade. 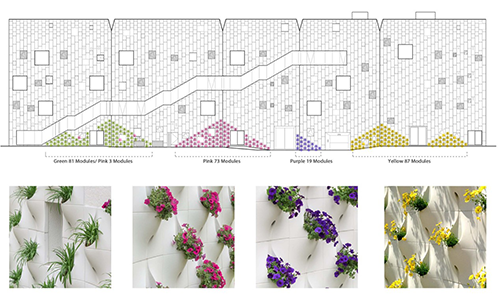 Consideration to the natural environment has been given with the designs' ground floor indoor garden, natural daylighting and ventilation, rainwater collection tank situated with photovoltaic cells on the building's landscaped rooftop. 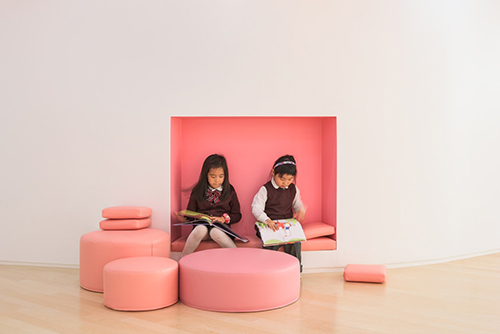 Further enhancing this idea of "dynamic space" are the classroom's curvilinear walls - the outward planes encouraging movement, whilst inside the classroom's wall creating a "loving" embrace. 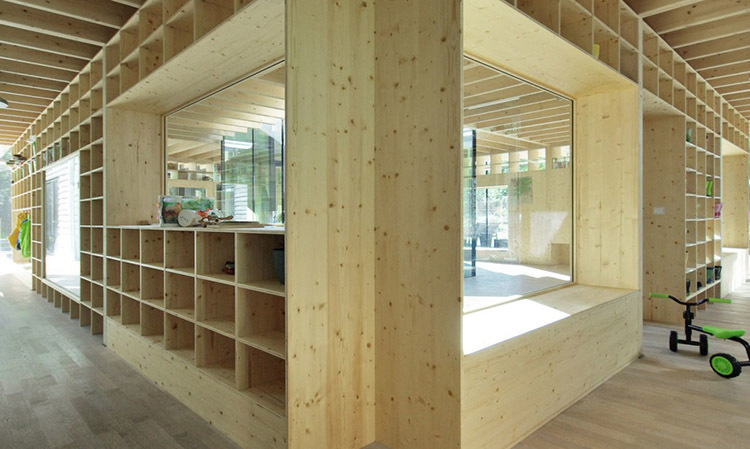 Central to the design are the stairs with a winding and continuous external window following and a SLIDE for children to travel downwards, whilst under - wee padded play dens. 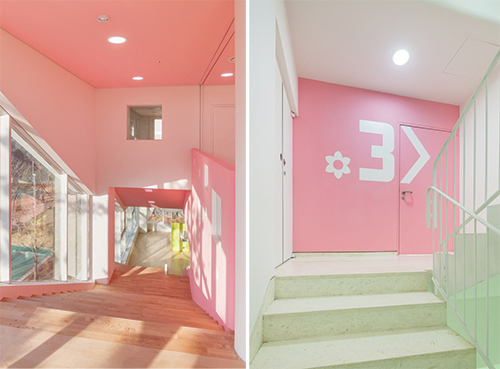 Above, not only is colour used for wayfinding through the building, but large numbers are painted on the walls to communicate their level. 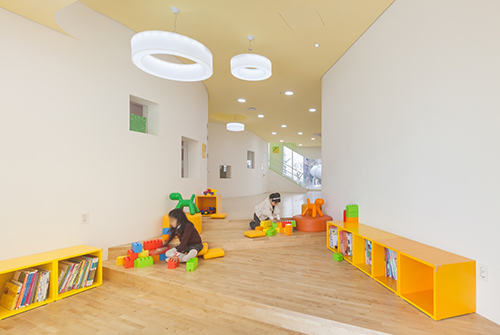 A language of circles and squares is used throughout the design, with round penetrations in the ceiling matching round soft "stools" or "poufs". 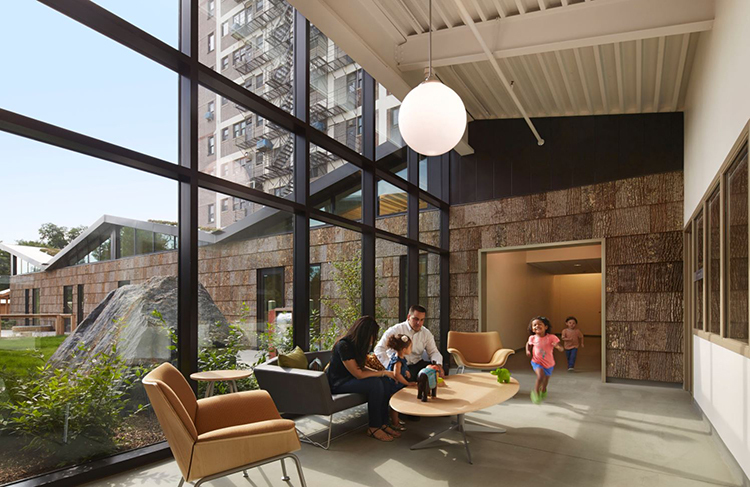 Whilst square windows penetrate surfaces both to the exterior and inside walls creating visual connections and spaces to sit. Colour has also been very well considered. 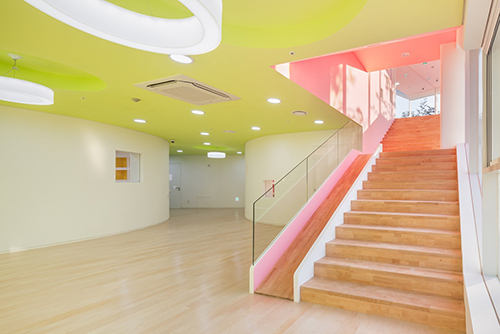 Instead of bright (often clashing) colour on every surface, the architects have opted for a subtlely changing colour scheme according to the type of space and its use. 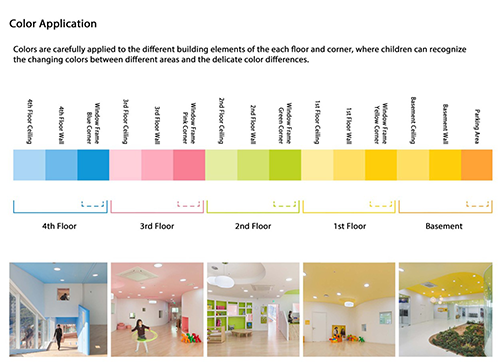 Each level is expressed by a different colour and tones of said colour, giving each its unique identity and experience expressed by natural daylight. 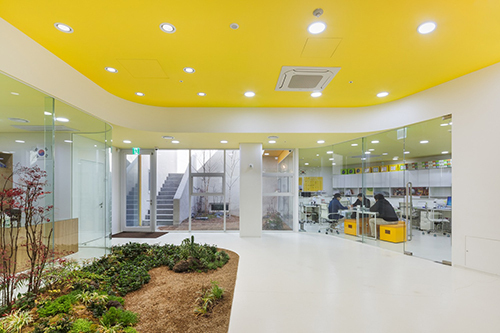 Bold colour is used to accentuate windows (to been seen from the street) and to accentuate internal cubbies or shelving among others. 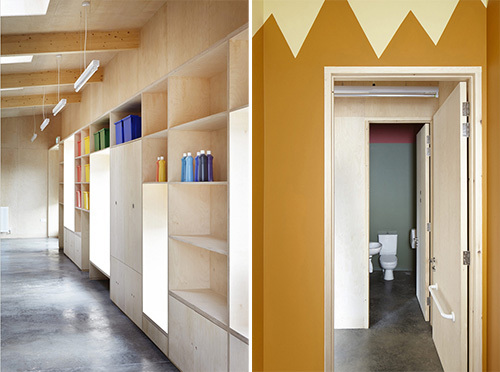 Colour to the ceiling (instead of walls) casts a soft glow to the room's walls. 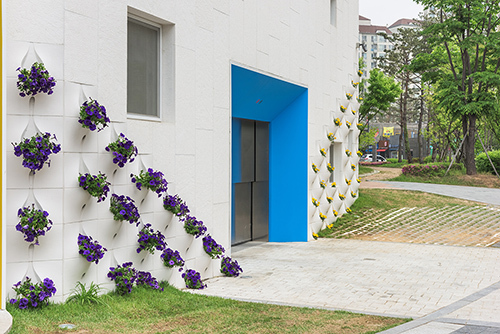 Perhaps my favourite feature is the facade "pockets" literally allowing the building's skin to come alive with seasonal pops of colour! 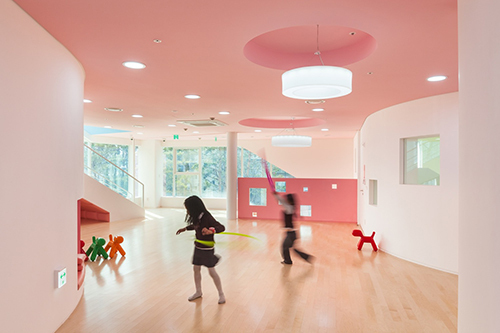 Overall, the kindergarten is like a flower in that it grows delicately in response to the complex requirements that is early childhood architecture and its context within a densely urban fabric. 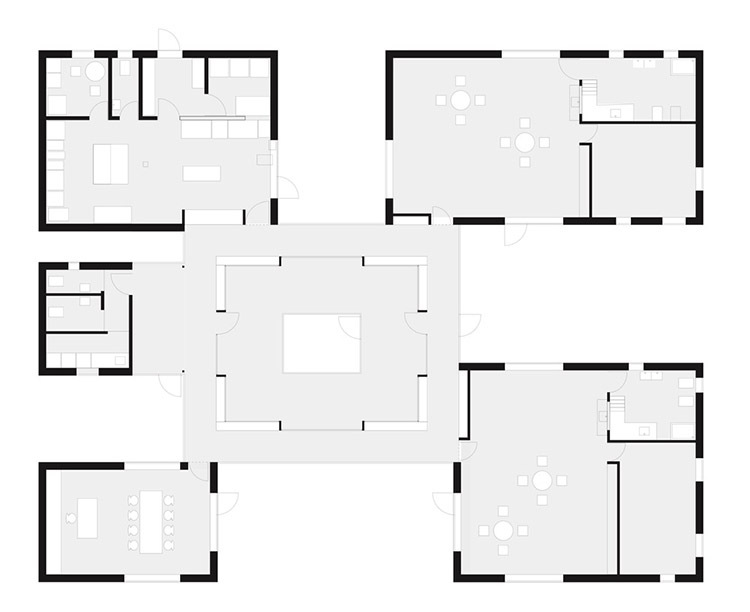 Click "read below" for the full set of plans. 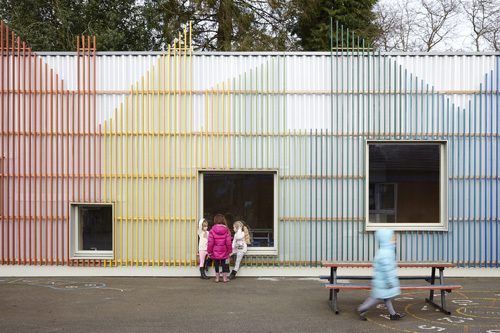 Designed by De Rosee Sa, the new dining 'Little Hall' at Prestwood Infant School was designed with much thought and with careful consideration for keeping costs down. 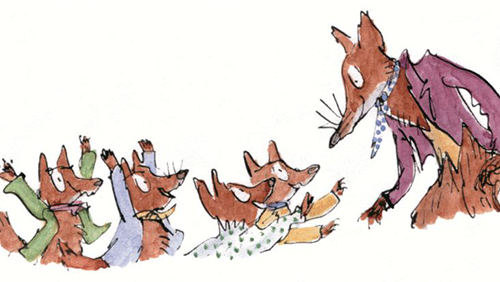 Taking their inspiration from Roald Dahl's Fantastic Mr Fox the building was conceived as "a little underground village, with streets and houses on each side - separate houses for badges and moles and rabbits and weasels and foxes." 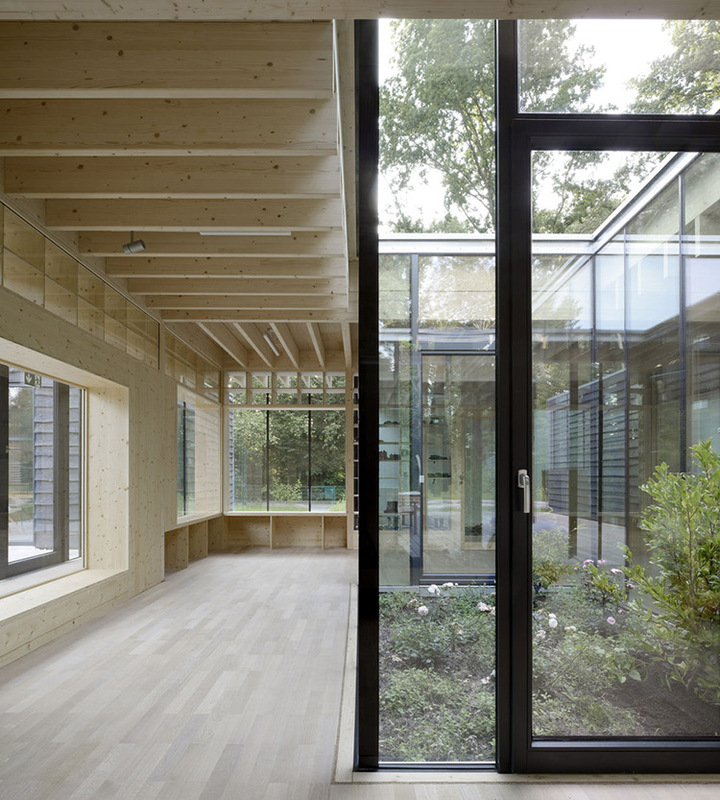 The architects cleverly kept costs down by using materials for both effect and durability whilst not being extortionate in their cost. 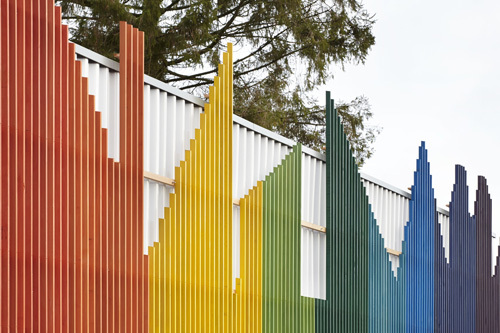 Externally, western red cedar battens stained in five graduating colours are fixed (via a horizontal batten) to white polycarbonate corrugate sheet. 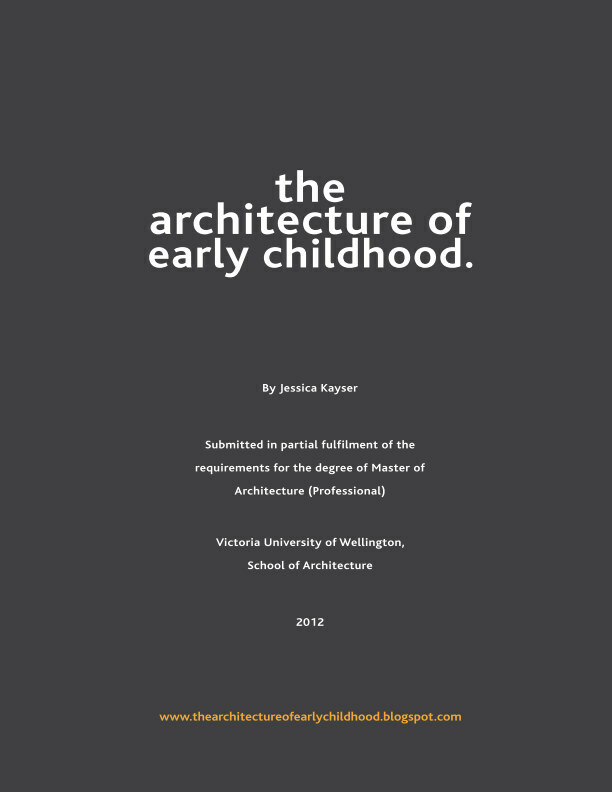 The profile (silhouette) of this facade matches the roof pitches of the existing school buildings. Making a nice link of the old with the new. 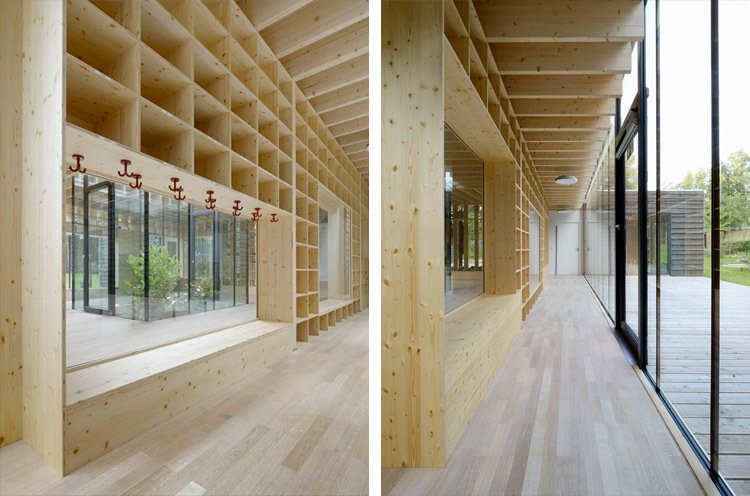 Internally six skylights allow for the inside spaces to be lit naturally, while stained ply is used for both the internal linings (walls and ceilings) and for the custom-built cabinetry. In keeping with the budget constraints, the structural concrete building pad (foundation) is used also as the internal floor surface. Polished smooth and sealed. This will also work nicely as a means to store (and slowly distribute) heat maintaining a moderate internal temperature. 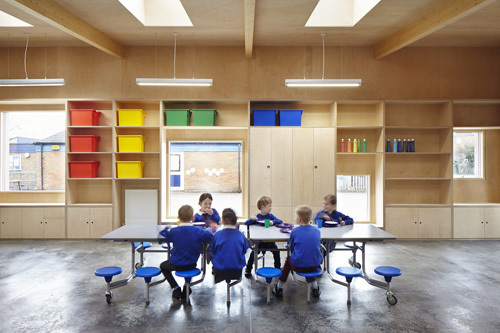 The simple yet well-thought design has considerably impressed the teachers and children. 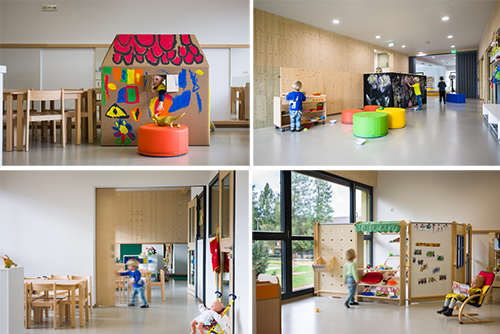 As Nicola Ratter the Head Teacher says "...Children will always learn more effectively if they are inspired and happy [and] 'The Little Hall' really does this for our children at Prestwood Infant School'.